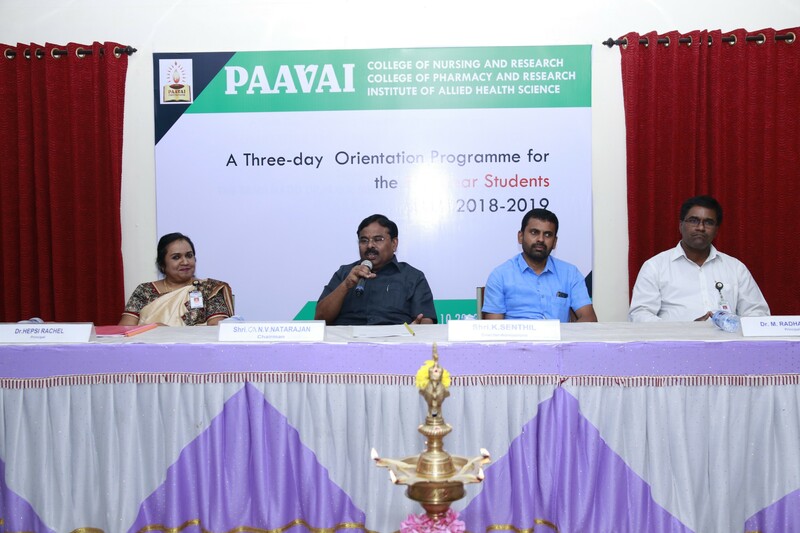 The Faculty Development Department organized a three day orientation programme for the first year Para-medical students of Paavai Institutions. The orientation programme was held on 29.10.2018, 30.10.2018 &10.11.2018 at Thirumandiram Hall.The Inauguration of the orientation programme was held, at ‘Thirumandiram Hall’ on 29.10.2018, wherein Dr.Hepsi Rachel Chella Rani, Principal, Paavai College of Nursing and Research, welcomed the gathering. 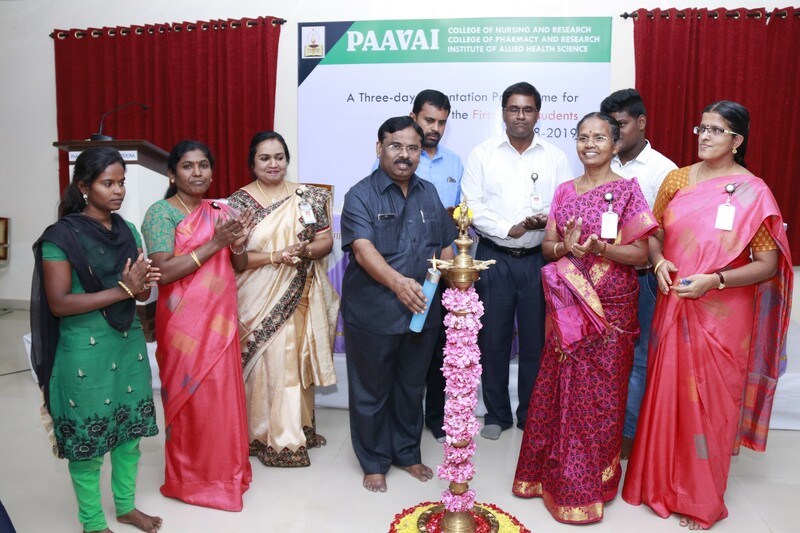 Shri.CA.N.V.Natarajan, Chairman, Paavai Institutions, in his inaugural address listed out the benefits of para- medical stream. He further stated about the scope and future of Para-medical courses. He highlighted the Biocon company which is the established commercial industry which makes a profit in millions. He also stressed the duties and the responsibilities of a pharmacist, nurse and technician in cardiology, etc. At last, he gave a preview of the orientation programme with resource persons along with their titles. Finally, he concluded that this orientation programme would be a foundation from which the respective course can be acquired and students can complete the course successfully and be placed in a reputed company or to become an entrepreneur. 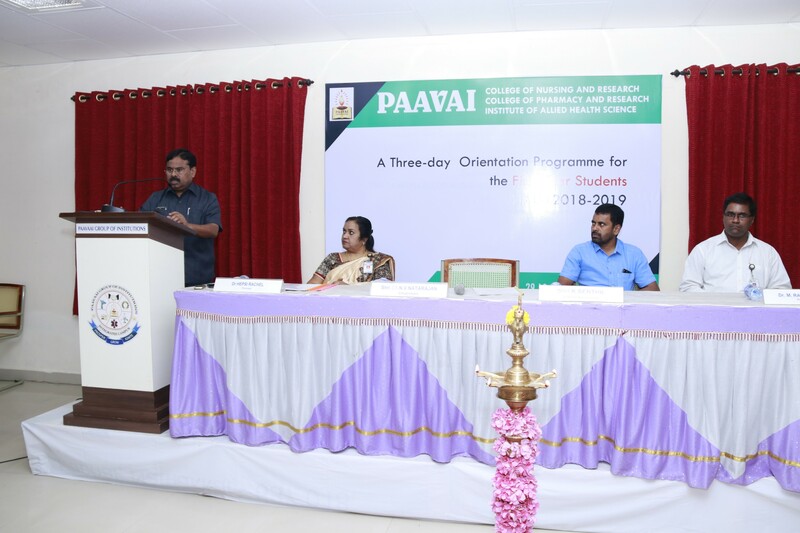 At the end of the inauguration, Mr.Arun, A.P, Paavai college of Pharmacy and Research, read out the objectives of the programme.The main objective is to make the students to acquaint with the institutional practices and culture by preparing them for the transition from school to professional education. 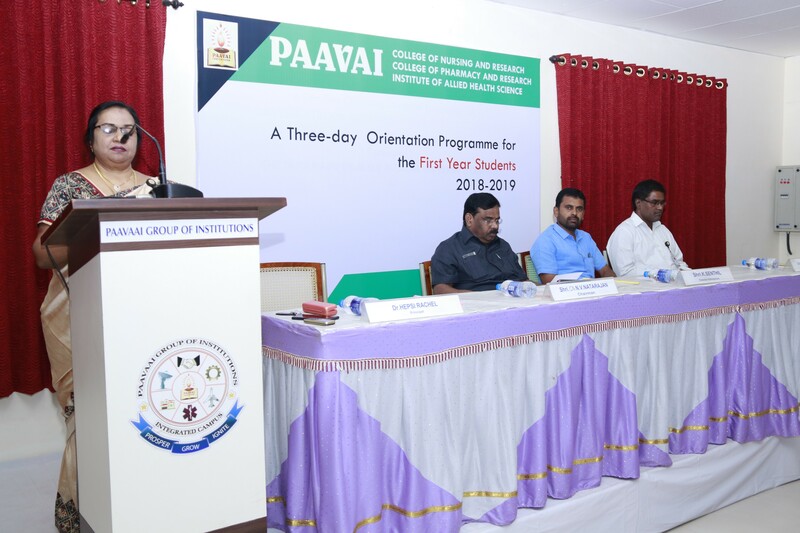 The resource persons were Shri CA.N.V.Natarajan, Chairman, Paavai Institutions, Prof.R.Chenniappan, Dean English, Dr.A.S.Kandasamy, Dean ECE, Dr.R.Kasthuri Bai, Dean FDD, Dr.K.Selvi, Dean Academics, Dr.Hepsi Rachel Chella Rani, Principal, PCNR, Dr.M.Radhakrishnan, Principal, PCPR, Mr.Loganathan, Head, Audio-visual Dept, Mrs.Devipriya, A.P, PCNR, Mr.Nagarajan, A.P, PCNR, Mr.Arun, A.P, PCPR, Mr.Sudhakar, A.P, PCPR and Mrs.K.Subashini, FDD addressed the students on various topics.After the inauguration, the students were made to assemble in Thirumandiram Hall for technical sessions. 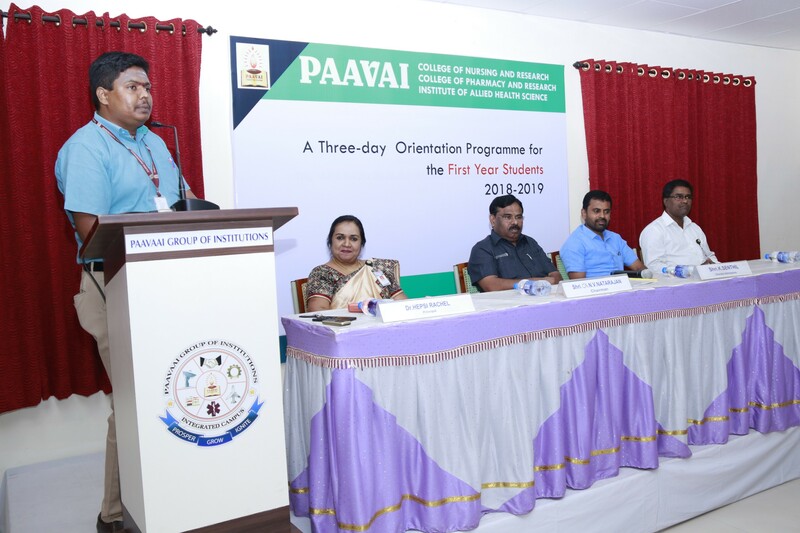 Shri.CA.N.V.Natarajan, Chairman, Paavai Institutions, spoke on the History of Paavai and Goal setting. He explained the vision, mission and his strong determination to establish Paavai as a guiding torch to the youth folk. He further focused on the steps for goal setting and methods to translate one’s goal into a reality. In this session, the life incidents of various individuals were cited.